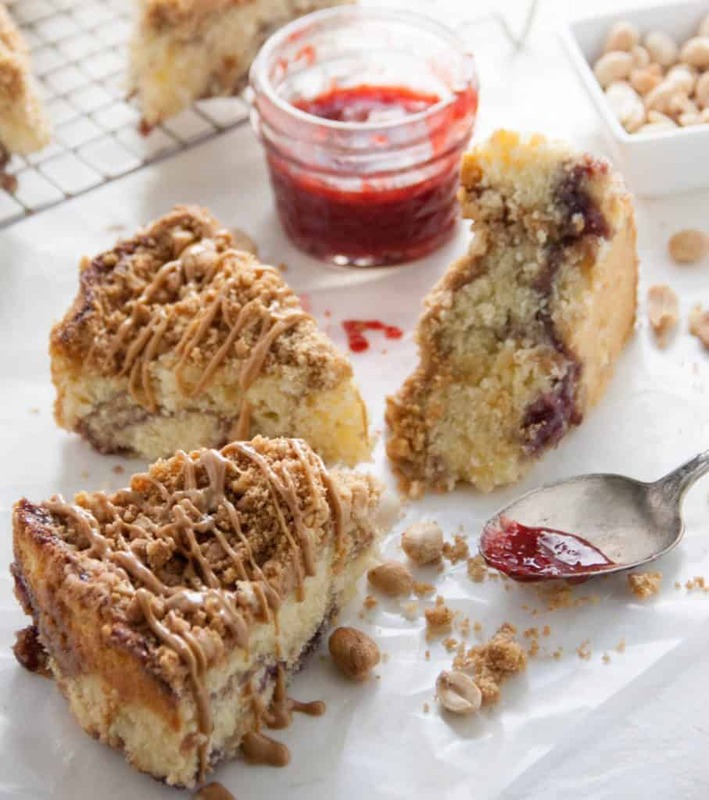 This peanut butter coffee cake (with jelly of course!) 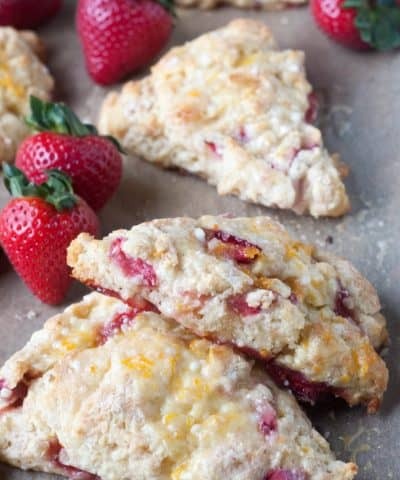 is everything you love about peanut butter and jelly for a breakfast treat. 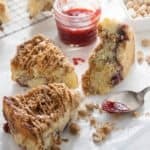 With a coffeecake that has a tender moist crumb and peanut butter, sweet raspberry preserves swirled in, crunchy peanuts and peanut butter swirl on top. 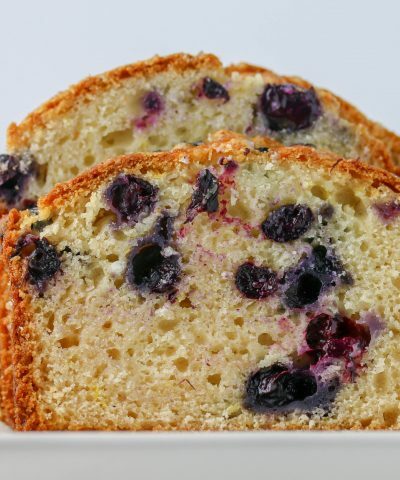 This coffeecake takes the classic sandwich flavor to the next level! I think one of the first things I learned how to make on my own, or should I say was allowed to make on my own was a peanut butter and jelly sandwich. And as an adult, the flavor combination still doesn’t disappoint. And when there’s “nothing to eat” in the house. Still peanut butter and jelly reigns supreme. So is it any wonder that this flavor combination would not only work in a coffeecake, it might be my new favorite coffeecake of all time? Exactly. No surprise. This coffeecake is actually from one of my favorite magazines, Bake From Scratch. It’s a magazine dedicated to baking from scratch (probably didn’t need to tell you that huh?). The beautiful glossy pages are such a sight to flip through. And the recipes? Um, swoon. And when I flipped through and saw this coffeecake, I knew I had to make it. And I am so glad I did. So I teach home ec in case you didn’t know. 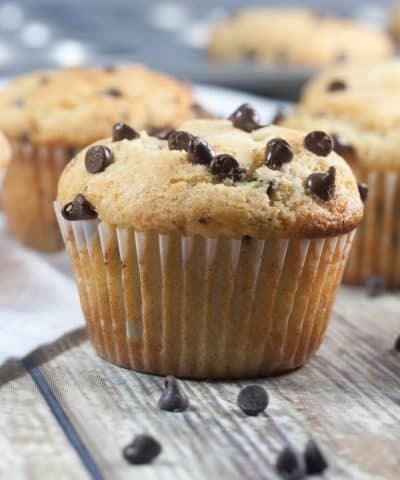 And we make coffee cake muffins every year. And every year students ask me “Are we really putting coffee in it?”. Short answer NO. How Do You Make A Coffee Cake? This cake is made in 2 6-inch cake pans. Just give them a quick spray and dust with flour and you’re all set. 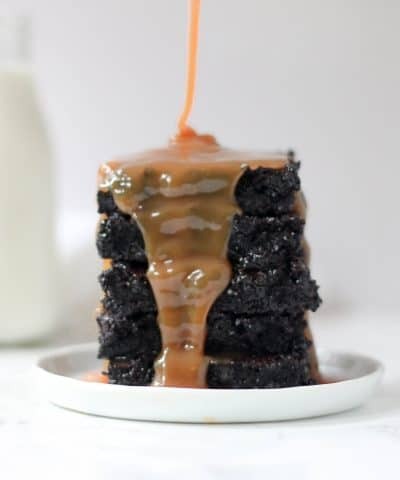 This peanut butter coffee cake mixture will be made in your stand mixer and starts with creaming your butter and sugar. It starts similar to make any kind of cake by creaming, adding your eggs, and then your vanilla. Then adding in your dry ingredients and alternating with buttermilk. Run out buttermilk? No sweat. Read my post on how to make your own buttermilk at home in 3 easy steps here. Oh good no random grocery store trips. And that’s it! You’re ready to bake! Just simply divide about 3/4 of the batter between your pans. Add in the raspberry preserves. 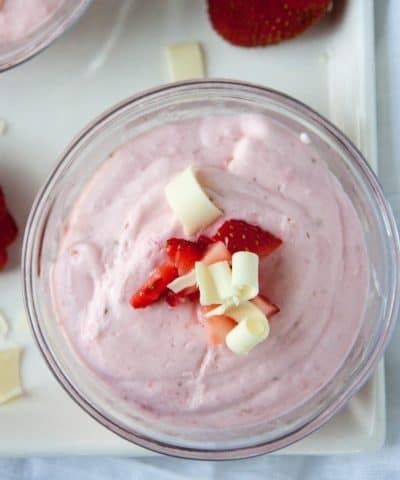 Or strawberry. Or grape if that’s your jam 😉 Top with the rest of your batter. 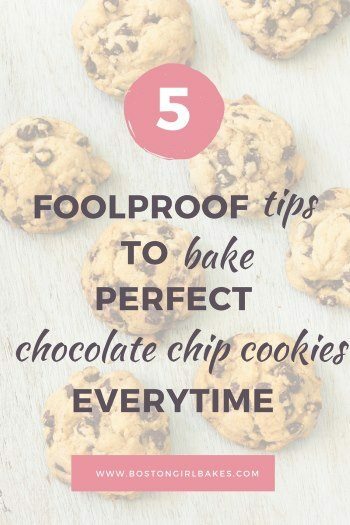 Be sure to measure your flour accurately. Scoop with a spoon and level with a knife! Here is a tutorial on how to measure flour accurately and why it’s important! Make sure to prepare your pans the right way by greasing and dusting with flour…and do it first so they are ready. Here is a tutorial on how to prepare your cake pans. 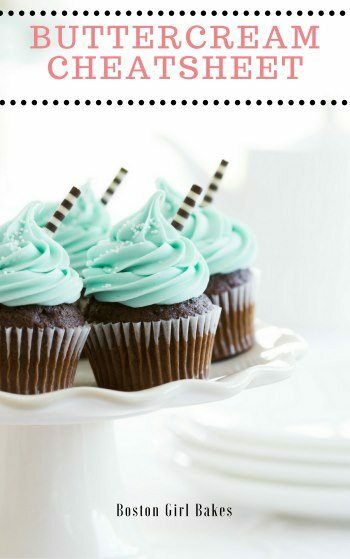 Make sure your butter is properly softened so it incorporates into your cake batter easily. Here are 3 quick ways to soften your butter. So skip the bread this time. 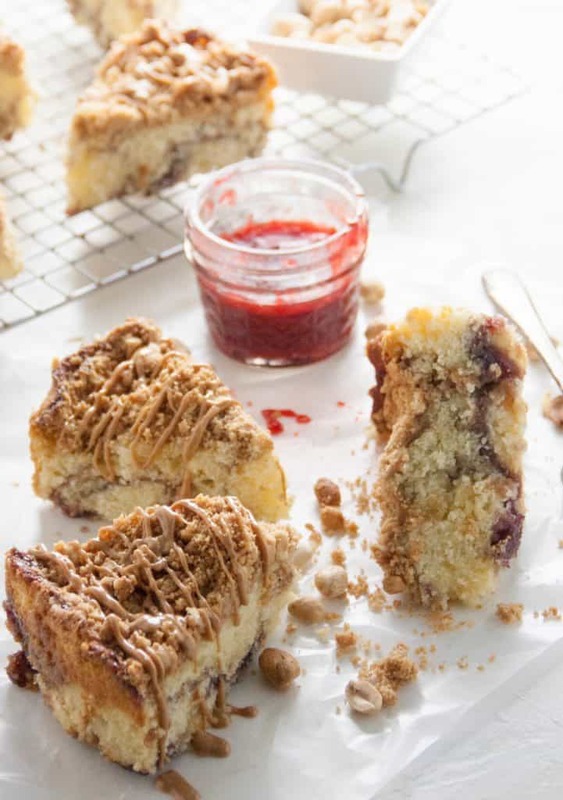 And whip up a peanut butter and jelly coffeecake instead. 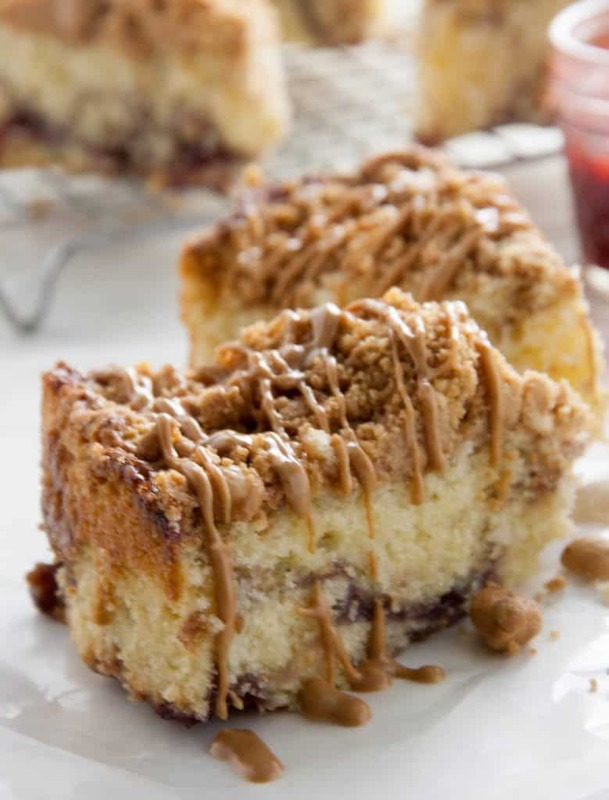 Peanut butter coffee cake with jelly swirl. 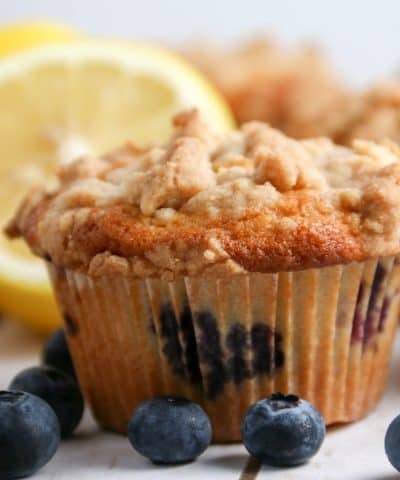 Topped with a peanut streusel! Preheat oven to 350oF. Spray 2 (6-inch) round deep cake pans with baking spray with flour. For streusel: In a medium bowl, whisk together flour and brown sugar. 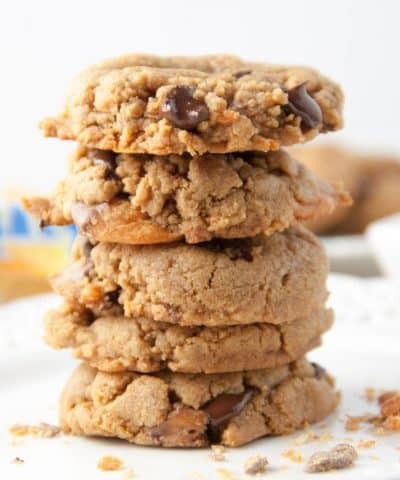 Stir in peanut butter and butter until mixture is crumbly. Crumble with your fingertips until desired consistency is reached. Stir in peanuts. 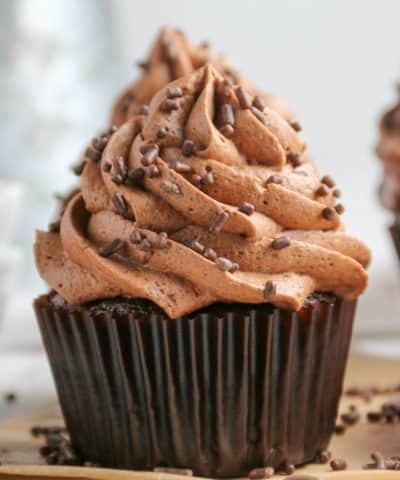 For the cake: In the bowl of a stand mixer fitted with the paddle attachment, beat butter and sugar at medium-high speed until fluffy, 3 to 4 minutes, stopping to scrape the sides of the bowl. Reduce mixer speed to low. Add eggs, one at a time, beating well after each addition. Stir in vanilla. 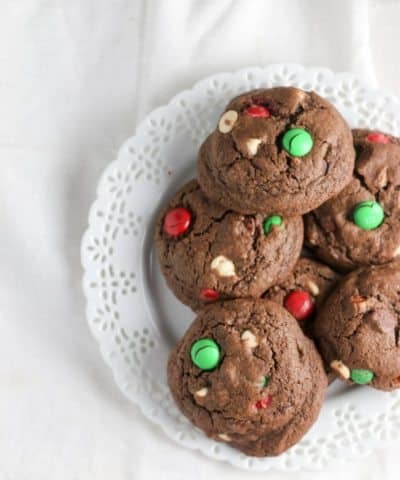 In a medium bowl, whisk together flour, baking powder, and salt. Gradually add flour mixture to butter mixture alternately with buttermilk, beginning and ending with flour mixture, beating just until combined after each addition. Divide three-fourths of batter between prepared pans. Spread with raspberry preserves, and top with remaining batter, smoothing tops with an offset spatula. Sprinkle with streusel. 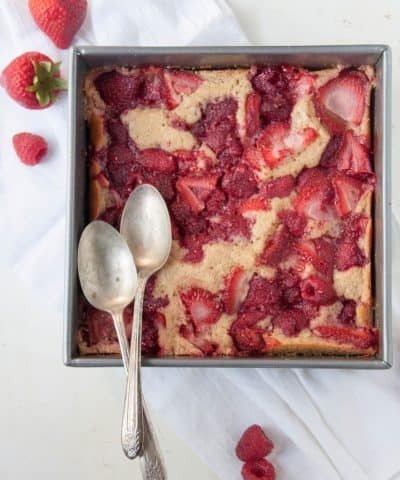 Bake until a wooden toothpick inserted in center comes out clean, 40 to 45 minutes, loosely covering with foil to prevent excess browning, if necessary. Let cool in pan for 15 minutes. Run a sharp knife around edges of cake to loosen sides. Invert onto a plate, and then invert again onto a wire rack. Let cool completely. Garnish with warmed peanut butter, if desired. Be sure to measure your flour accurately. Scoop with a spoon and level with a knife! 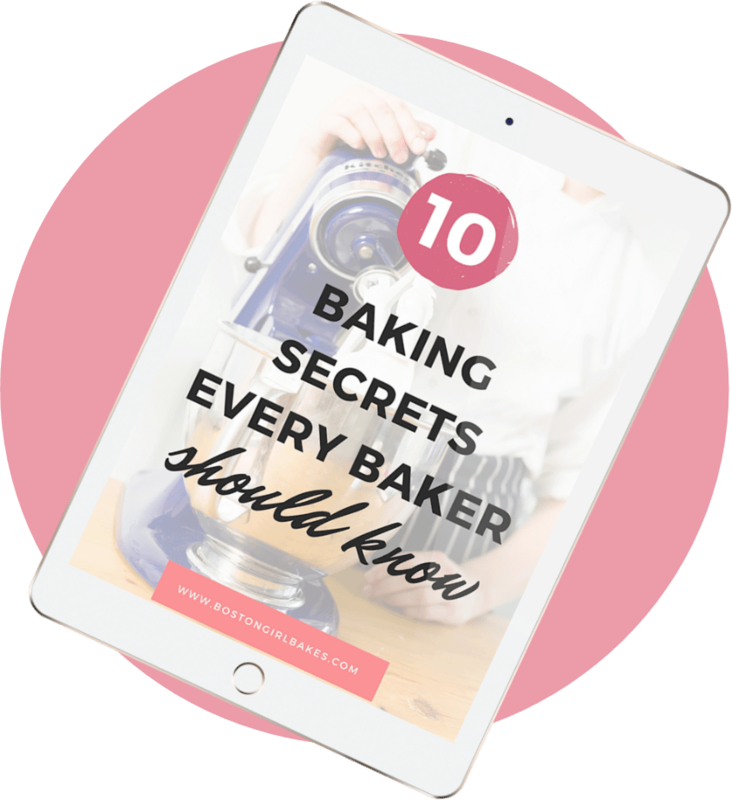 Here is a tutorial on how to measure flour accurately and why it's important! Make sure to prepare your pans the right way by greasing and dusting with flour...and do it first so they are ready. Here is a tutorial on how to prepare your cake pans.